When we made stew we needed corn bread! 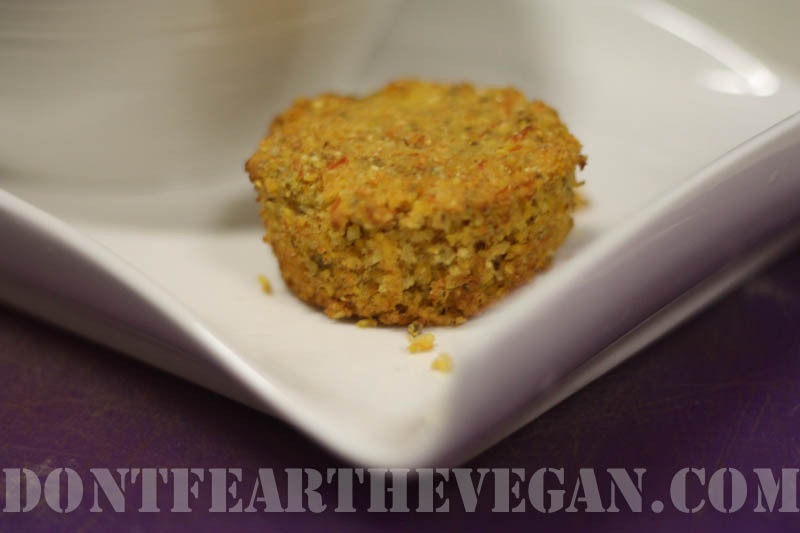 Usually Hubby makes our cornbread from a mix and it is pretty tasty, but going with the idea of using up what we had in the cupboards and fridge, the little vegan, Anzia, and I decided to try it from scratch. When doing things from scratch, why not switch them up a bit? With this mentality we opted to add carrots. Well, quite honestly, I wanted to add the carrots, Anzia did not. I won. She loved the finished product. *This recipe is not as sweet as the box mix we usually have. If you like a sweeter cornbread, I recommend adding 1/4 cup of brown sugar to the mix. *I used vanilla almond milk because I thought it would add a good flavor. *I have been on a chia seed kick lately. If you don’t have them, you could replace them and the water with 1/4 cup apple sauce or you favorite egg replacer, equaling one egg. *I used medium ground cornmeal because it is what I had. They had a bit of a gritty, crunchy feel on the tongue which we liked. If you prefer yours softer use fine ground. *We topped ours with bee-free honey butter (vegan butter of course) and it was tasty. If you don’t have bee-free honey you could also use agave, maple syrup, or a little apple sauce. Use 1/4 cup butter to 1 teaspoon of the sweetener. In a cup mix almond milk and vinegar together. Set aside for 15 minutes. In a separate cup mix together chia seed a water. Set aside for 15 minutes. Preheat oven to 375. Line muffin tin with papers. In a large bowl mix together corn meal, baking soda and salt. Create a well in the center. Set aside. In a separate bowl mix olive oil, maple syrup, milk mixture, and chia mixture. Blend together well. Pour olive oil mixture into corn meal mixture. Stir until well blended. Fold in corn and carrots. Fill muffin tins equally. Bake for 25 minutes or until edges are slightly browned. Let cool five minutes before transferring to a cooling rack. Enjoy. Ours stayed good for 5 days. Gallery | This entry was posted in Anzia's picks-a young vegans perspective, Bread, Gluten Free and tagged bread, cornbread, dairy-free, gluten free, muffins, vegan. Bookmark the permalink. Though carrots are not that fav of mine, the muffin do sounds yummy. Oh, thank you so much! We just started eating a vegan diet this week, and I made my husband’s favorite chili, but without the ground beef…and I didn’t want to deprive him of cornbread, too! Thanks!